The Iraqi Baath party was one of the tools by which Saddam Hussein maintained a tight grip on his country. The Arab Socialist Baath Party, to give it its full name, was founded in Syria in the 1940s by a small group of French-educated Syrian intellectuals - Michel Aflaq, a Greek Orthodox, and Salah al-Din al-Bitar, a Sunni Muslim. The word Baath means renaissance in Arabic. The party's ideology is pan-Arab, secular nationalism. A committed Baathist should see individual Arab states as regions or provinces of the larger Arab nation. The party is secular, and in the beginning, was steeped in Socialist ideology. The Baath party also became the ruling party and bureaucracy in Syria - a fact that led to great rivalry between Damascus and Baghdad, rather than alliance. The Iraqi Baath party was founded in 1951 and had 500 members three years later. Saddam Hussein joined it as a 20-year-old in 1956. The party came to power on 8 February 1963 in a coup backed by the Army, overthrowing Brigadier Abdel Karim Qasim - who himself overthrew the British-installed Iraqi monarchy in 1958. The Baathist hold on power did not last long. Within months, Brigadier Qasim's ally, Colonel Abdel Salam Muhammad Aref, seized power. Saddam Hussein was elected assistant general secretary of the party in 1966 and staged a successful coup in 1968. 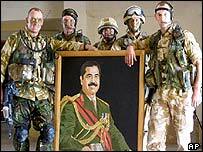 General Ahmad Hasan al-Bakr, also from Tikrit and a relative of the Saddam Hussein's, took power. The two worked closely together and became the dominant force in the Baath party, with Saddam Hussein gradually outstripping the president's leadership. Though the Baath party was formally the institution that ruled Iraq, actual power, even in the early days, was in the hands of a narrow elite united by family and tribal ties, not ideology. During the 1970s surnames were abolished to attempt to disguise this - ID cards and birth certificates recorded only the individuals first name and father's name. Baathism was associated with radical Arab nationalism - a key barometer for this was a hardline approach to the Palestinian issue. In the late 1980s, the party claimed more than 1.5 million members, about 10% of Iraqis. The party had a highly regimented structure. At the lowest level - the village - it had cells of between three and seven people, rising up to regional commands and a national command. The Baath was meant to rule and make policy by consensus. In Iraq, all major decisions went through Saddam Hussein who from 1979 was president, head of the Revolutionary Command Council and secretary general of the Baath party. In 1979 several high-ranking Baathists were tried and were executed for allegedly planning a coup. Other prominent party members were forcibly retired in 1982. In the 1980's, the socialist ideology of the party accommodated itself to capitalism. Nationalised industries were privatised. Iraqi businessmen trying to take advantage of the country's oil wealth often pursued their ambitions through the party. 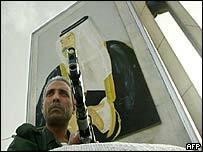 As part of Saddam Hussein's power structure and complicit in his brutal rule, the Baath party was expected to disintegrate with the end of his rule. Revenge attacks against Baath officials and party buildings were widely predicted and have happened. US plans for Iraq after Saddam Hussein are assumed to include the dismantling of the Baath. Analysts have warned though that the destruction of the Baath might lead to the destruction of the vast numbers of civil organisations swallowed up by the Baath during years of totalitarian rule.